Simic Guildgate enters the battlefield tapped. Just checked back to see if you had taken any of the advice yet/at all (I like to do that- helps me get a better idea of what to recommend in the future) and noticed Explosive Vegetation in the list along with a Simic Guildgate . I know that this small a change is kinda splitting hairs, but have you seen the new card Circuitous Route ? I believe it is a strict upgrade at roughly the same price. Alternatively there is also Skyshroud Claim which, while not strictly better due to its not being able to fetch islands, does bring the forests into play untapped, and is about 40 cents cheaper. Battlebond was a very good set for commander players. Is this the Fish deck you're using? The reason you're losing is you're not playing the two strongest cards for the deck (which are also the reason you play the deck in the first place)! You should have no problems steamrolling non-red aggro decks, control, and have okay match-ups against midrange. You won't beat RDW/Burn, so if you get paired up against them don't sweat it if you lose. R/W variants are easier to beat. Just keep Goblin Chainwhirler in mind and don't get 10-for-1'd by overextending with 1/1s. Spell Pierce and Dive Down laugh in the face of boardwipes (like Deafening Clarion or Settle the Wreckage ) because you can often just go full HAM and keep 1 mana open, which will force your opponent to tap out for the wipe. They get BTFO'd and you kill them anyway. Watertrap Weaver and Tempest Caller can often end the game just by creating so much tempo, especially against decks that rely on smaller amounts of large creatures. 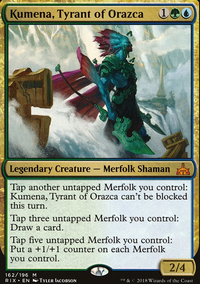 You should still get a Kumena, Tyrant of Orazca even if you decide to play EDH because he's a powerhouse of a general. You might consider some cheap replacements: Vivid Creek , Vivid Marsh , Vivid Crag and Vivid Grove instead of Dismal Backwater , Jungle Hollow , Rugged Highlands and Swiftwater Cliffs for extra mana-fixing (which is needed in a 4-color deck). Also: Llanowar Wastes , Yavimaya Coast and Shivan Reef are cheap untapped lands. 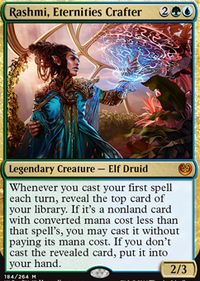 // You might consider Farseek , Sakura-Tribe Elder , Explosive Vegetation and Circuitous Route for further ramp. Farseek can grab Sunken Hollow , Smoldering Marsh or Cinder Glade , while Circuitous Route can search for Simic Guildgate , Izzet Guildgate and Golgari Guildgate . // You might run Fact or Fiction , Steam Augury and Ancient Excavation for early card draw and graveyard filler for delve cards, like Murderous Cut , Dig Through Time and Tasigur, the Golden Fang (they all got reprinted). Brainstorm and Painful Truths are also great draw spells. 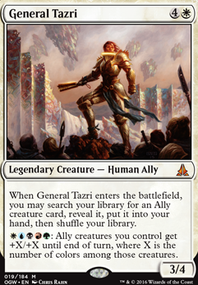 // Izzet Charm , Crosis's Charm and Sultai Charm are really versatile removing threats. They could replace Scour from Existence . 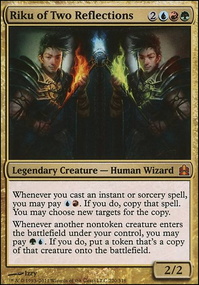 // Zendikar Resurgent is a mana-doubler, which can fuel big Comet Storm , Blue Sun's Zenith , Pull from Tomorrow , Exsanguinate and Curse of the Swine . // Since you are playing expensive spells, Deep-Sea Kraken , Combustible Gearhulk , Avatar of Fury , Avatar of Woe , Primeval Protector , Sunbird's Invocation , Metallurgic Summonings are great ways to deal a lot of damage. Thanks for reminding me about Wilderness Reclamation. You would be surprised how well this Standard fixes colors with Shock Lands and Check Lands legal. Top tier Izzet decks all run 4 Crackling Drake and around 20 lands. They are ran in Jeskai too. 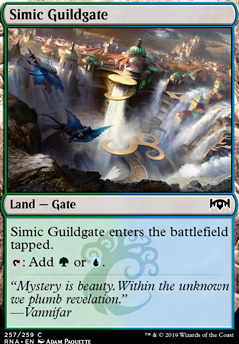 Simic Guildgate and Woodland Stream can be added if there needs to be more color fixing, but i don't think its necessary. I'm on the fence about a lot of things until the rest of the set is spoiled. But, I can see 2 potential Simic decks: an Adapt focus and an Explore focus. Combining the 2 is probably not the best choice, but we'll see next week when the rest of the set is spoiled which version looks more appealing. You might be on to something with Shapers of Nature but I'm not feeling it right now. It relies on the Familiar too much to be good. The Familiar will probably be a kill on site and there is a lot of different removal right now. The card draw is reliant on counters and some set up. Blue also has a lot quicker, self reliable draw. I think this block is going to be get very interesting (broken). I'm hoping to see Temur and Sultai control in the future. Since your curve peaks at 4 mana, I recommend that you focus on 2-mana accelerants: Nature's Lore, Farseek, Sakura-Tribe Elder, Fellwar Stone instead of Abzan Banner, Ratchet Bomb (also destroy your board), Verdant Automaton (too slow), Arcbound Slith and Arcbound Worker (too slow). 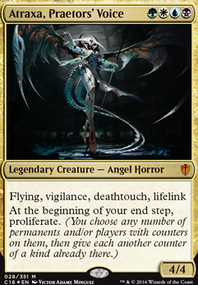 // Rishkar, Peema Renegade can put the first counter on creatures so you can proliferate them and tap them for mana when needed. Abzan Charm has great versatility. Odric, Lunarch Marshal has great synergy with Atraxa, Praetors' Voice. Chasm Skulker and Cathars' Crusade require quick answer or else they win you the game. Orzhov Advokist serves double duty: she deters opponents from attacking you if they accept the offer, and also put counters on your creatures for free. Lim-Dul's Vault is a great tutor. 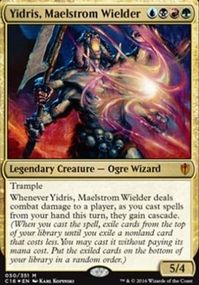 Utter End, Anguished Unmaking, Abzan Charm, Swan Song, Beast Within, Swords to Plowshares and a overloaded Cyclonic Rift are great for dealing with your opponents' threats. 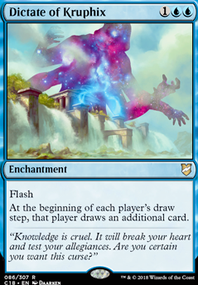 // In the card advantage department, Bred for the Hunt, Path of Discovery (also create counters), Shapers of Nature (also create counters), Zameck Guildmage and Etched Oracle are repeatable draw while Rishkar's Expertise, Prime Speaker Zegana, Painful Truths and the aforementioned Abzan Charm are 1-shot card draw. // I suggest you to replace Grasping Dunes, Ifnir Deadlands, Survivors' Encampment, Simic Guildgate, Tranquil Expanse and Deeproot Champion (almost all your deck are creatures) by Yavimaya Coast, Caves of Koilos, Exotic Orchard, Bountiful Promenade, Sea of Clouds, Morphic Pool, upping your land count to 37. Also Victory Chimes, Arixmethes, Slumbering Isle, Traverse the Outlands, Seedborn Muse, Mana Reflection, Zendikar Resurgent, Regal Behemoth, Vorel of the Hull Clade, Doubling Season. 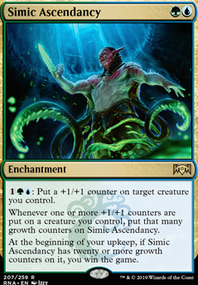 You might consider Simic Guildgate, Simic Growth Chamber.